The best thing about pumpkin soup is its rich, creamy texture that warms you up in no time on a cold winter’s night. 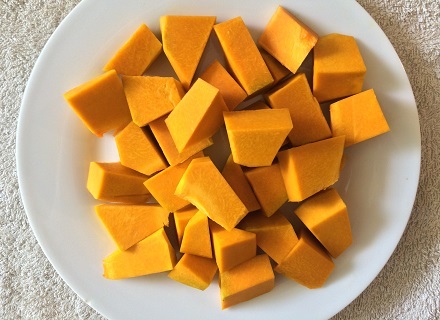 Pumpkin soup can be prepared in many different ways, but I personally love adding a bit of spiciness. I also like to make it as nutritious as possible to make the most of it, so I add in lots of different vegetables. 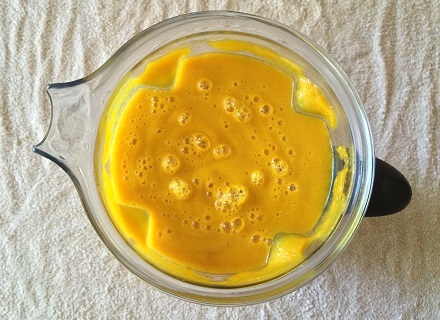 Whenever I prepare pumpkin soup, I use my blender in the final step of the process to create that perfect texture. Make sure you cook everything for around 20-25 minutes to make it nice and soft, and then simply blend it for a minute or so before serving. So here we go, a simple recipe for insanely delicious, blended spicy pumpkin soup, topped with fresh garnish and Greek yogurt. Feel free to play around with the ingredients as everyone’s taste buds are different. Be particularly mindful about how much onion, chili and ginger you add in, but for me personally the below recipe works really well (caters for 3-4 people). Add salt and pepper to taste and perhaps some garlic or turmeric powder for extra flavor. 1. Chop the pumpkin, carrots, onion and apple. 2. Heat up the oil in a large saucepan at low heat. First cook the onion for a few minutes (while stirring) and then add the grated ginger. Cook and stir for an extra 2 minutes. 3. Add the pumpkin, carrots, apple and chicken stock. Bring to boil on medium heat. Let it simmer for 20-25 minutes (stirring frequently). 4. Put all the contents of the pan in a blender and blend until smooth and thick. 5. Chop the tomato and cucumber in small pieces. 6. Serve into 2-4 bowls and add a bit of plain or Greek yogurt. Top it off with the fresh garnish (tomato, cucumber and one or two coriander leaves) and serve with two slices of brown bread! Note that the soup should be thick enough to keep the garnish floating on top. Instead of brown bread you could also choose to serve this delicious spicy pumpkin soup with some naan bread, or perhaps some rice. Feel free to have a play with the fresh garnish on top of the soup, depending on your personal taste. 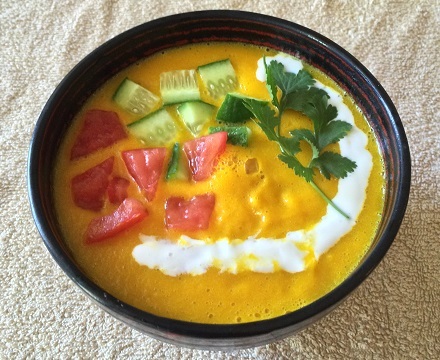 I personally love the flavors of the cucumber, tomato, coriander and yogurt that rest on top as it mixes very nicely with the pumpkin soup. It also gives the soup that extra refreshing look which is important when serving guests. 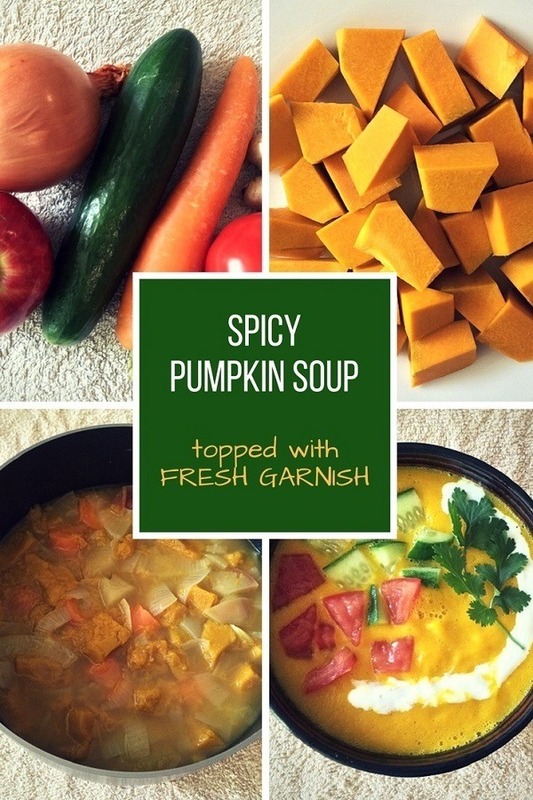 Below is a printable version of this delicious pumpkin soup recipe. Enjoy! 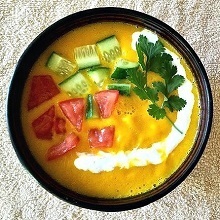 A simple recipe for delicious spicy pumpkin soup, topped with fresh garnish and yogurt. 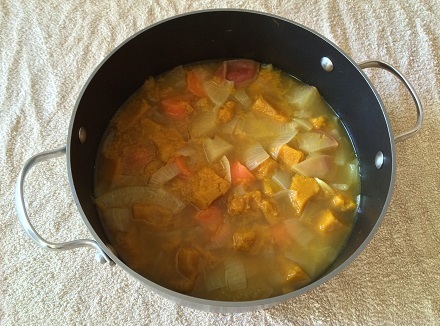 Chop the pumpkin, carrots, onion and apple. Use a large saucepan to heat up the oil at low heat. Cook the onion for a few minutes (while stirring) and add the grated ginger. Cook and stir for an extra two minutes. Add the chopped pumpkin, carrots, apple and the chicken stock. Bring to boil on medium heat. Let everything simmer for 20-25 minutes while stirring frequently. Place everything in a blender and blend until smooth and thick. Chop the tomato and cucumber in very small pieces. Serve the pumpkin soup into 2-4 bowls and top it off with the tomato and cucumber and one or two coriander leaves. Add a bit of yogurt and serve with two slices of brown bread. The soup should be thick enough to keep the garnish on top. If you don't like plain bread, you can also add naan bread or some rice. You can also experiment with the garnish and use other types of greens to satisfy your taste buds. Enjoy!